AUGUSTA -- The two-company race to bring natural gas to the Kennebec Valley rolls on in corporate conference rooms, town halls, roadside ditches and now, atop a barge in the Kennebec River. AUGUSTA — The two-company race to bring natural gas to the Kennebec Valley rolls on in corporate conference rooms, town halls, roadside ditches and now, atop a barge in the Kennebec River. 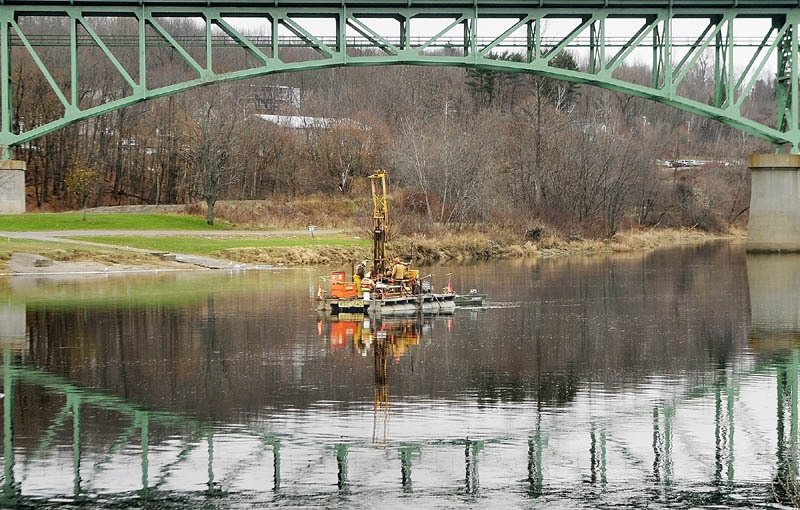 A crew hired by Maine Natural Gas, one of the two firms competing to bring natural gas to customers in Augusta and the Kennebec region, took test borings in the Kennebec River this week to sample the soil below, determining the proper location and depth for its pipeline to cross the river. 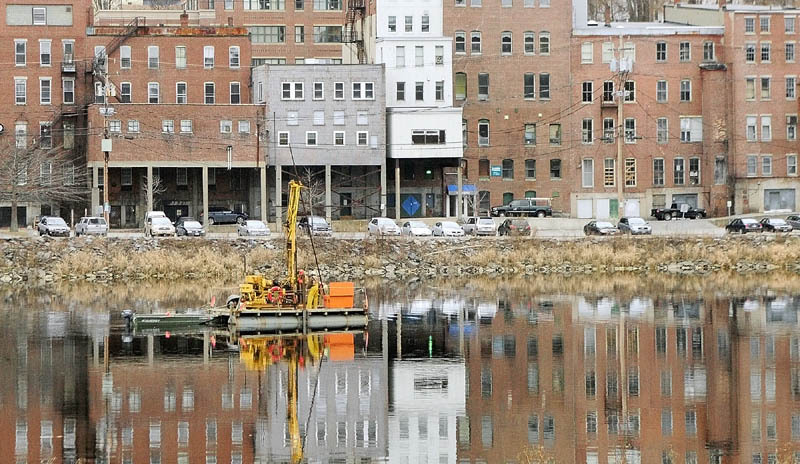 The Maine Test Borings crew of three men, from a 25-foot barge moved around by a small motorboat this week, drilled down into the riverbed just upriver from Memorial Bridge between the city’s boat landing and downtown. A more specific location to cross the river will be picked after the test boring results are studied. After that, Maine Natural Gas plans to bring its proposed pipeline across the river as soon as possible in 2013, according to spokesman Dan Hucko. Officials with competitor Summit Natural Gas of Maine agree bringing natural gas to the region is fast becoming a reality, but they want to be the ones bringing the gas. Summit insists it will bring gas to far more people and will provide a larger financial boost to a much wider area. Colorado-based Summit is seeking the unconditional approval of the Maine PUC to serve customers in Maine before it can move ahead with construction of its proposed pipeline from an existing pipeline in Windsor into Augusta and south as far as Richmond and north as far as Madison. Maine Natural Gas already has such approval and in recent months has been installing pipeline in ditches in the area. Summit officials said they’re not concerned Maine Natural Gas is already putting pipe in the ground while they await final PUC approval to start work, which could come by year’s end. A PUC technical conference is scheduled for Dec. 12. Summit officials said they’ve distributed proposed letters of intent to municipalities throughout the region, asking them to vote on a non-binding statement indicating that they’d take Summit’s gas to heat municipal buildings. Ken Young, executive director of Kennebec Valley Council of Governments, hosted a meeting between municipal leaders and Summit earlier this month, and assisted Summit in sending out the proposed letters of intent. So far, only selectmen in Belgrade have signed on. Young said the letters of intent will help Summit judge how much demand for natural gas there may be in a given municipality. Since they are non-binding and don’t commit the municipality to buy gas from either company, he sees no harm in officials signing them. Summit has also inked letters of intent with multiple large- and mid-size commercial customers in the Kennebec Valley, according to Kenneth Bonn, executive director of J.P. Morgan’s Global Real Assets – Infrastructure Investments, the financial backer of Summit’s project. Those customers include Hannaford, which plans to use gas from Summit’s pipeline at seven of the supermarket chain’s buildings in central Maine, Bonn said. Hucko, however, downplayed Summit’s letters of intent and pointed to contracts as more important, such as the one Maine Natural Gas has to provide gas to the new regional MaineGeneral Medical Center hospital under construction in north Augusta for the next decade. Maine Natural Gas’ contract with MaineGeneral commits the firm to provide gas to the hospital by next November. The gas would be provided via the pipeline for which the Kennebec River crossing is being investigated. That section of the pipeline, Hucko said, will cross the river to the west side and run west along Western Avenue, then turn and follow Leighton Road to the new hospital. He said the main line of the pipeline will stay on the east side of the river and is designed to continue north to Waterville, Winslow, Fairfield, Skowhegan and Madison, if there is demand. Both companies would like to have the state government as a major user of the natural gas they plan to provide. But the state’s efforts to strike a deal for natural gas to heat buildings in Augusta were scuttled, at least for now, when an appeals panel ruled in September that the bid process used by the state Bureau of General Services to select Maine Natural Gas was flawed and invalid. Maine Natural Gas has since filed a lawsuit, which has yet to be decided by the courts, contesting the state’s approval of Summit’s appeal. State officials have not yet issued a new request for proposals to connect a gas pipeline to state buildings. A spokeswoman for the state Bureau of General Services said Thursday there was no update on whether the state would issue a new request for proposals. Young said a major difference between the two companies’ proposals is scope. Summit officials have said they will build a $150 million pipeline system to distribute natural gas throughout the Kennebec valley, while Maine Natural Gas officials said they will build a system into Augusta and will expand it to the rest of the region if there is enough demand to make it economically feasible. Hucko said if the demand is there, Maine Natural Gas’ project will also build a roughly $150 million system. Maine Natural Gas’ tariffed rates for residential service are estimated at $6.08 per decatherm, while Summit’s proposed rates are estimated at $10 per decatherm. One decatherm is the equivalent of 100,000 British thermal units, or btu, and the equivalent of about 7 gallons of No. 2 heating oil, according to www.think-energy.net. Summit officials said they’ve already determined it is economically feasible to build a distribution to serve the entire region, and that is what they are committed to do. While acknowledging their rates will indeed be higher than the rates of Maine Natural Gas, Summit officials said there is a reason for that. They said Maine Natural Gas’ rates won’t provide nearly enough revenue to construct a distribution system throughout the region. So Summit’s system, funded by its higher rates, would serve far more people over a much wider area, company officials say. Earnest said residential customers switching from oil to natural gas would save an average of $1,700 a year based on current prices, and small commercial customers would save an average of $5,700 a year.